Need a bigger screen? Share your presentations, spreadsheets, and more with your friends and colleagues using the Collaboration Station. A large television screen is now located at the front of the Learning Commons on the first floor of the library. Simply plug the VGA or HDMI cable into your laptop. Need help? Directions are located by the screen, or you can ask for assistance at the Learning Commons desk. Happy collaborating! Meet Raquel Sauceda, the Monroe Library’s Friend of the Month! This program recognizes students who frequently borrow a variety of library materials. Raquel is a third year Junior majoring in Biology. She hopes to pursue a career in reconstructive plastic surgery. She is from Texas but has embraced the culture of New Orleans and loves it here. Raquel enjoys using the library for quiet study and to escape the sometimes loud atmosphere of the dorms. She frequently uses the study rooms and finds that they are a good place to meet with groups to prepare for tests. Because she prefers the quiet areas of the library, Raquel suggests that we add computers to the second and third floors. When she is on those floors she often needs a computer for just a moment and does not always have her laptop with her. Spring 2012 Extended Study has come and gone. 1. A valid Loyola ID is required to use the library during 24/7. 2. Beginning at 9pm (6pm on Friday & Saturday), the front doors will be locked and users must enter and exit through the computer lab entrance. 3. At 9pm (6pm on Friday & Saturday), users must present their valid Loyola ID to enter the library. 4. In order to check out a group study room, 2 valid Loyola ID’s must be presented and there are NO RENEWALS on study rooms. 5. Only members of the Loyola community are permitted to use the library after 9pm Sunday-Thursday, and after 6pm Friday & Saturday. 6. The 2nd and 3rd floors of the library are reserved for quiet study. 7. Study groups should work in the Learning Commons on the first floor, or in one of the group study rooms. 8. Never leave your valuables unattended! 9. Help us and our wonderful WFF crew keep the library clean during 24/7. Take your trash with you when you go. 10. Free coffee and tea will be available after Midnight! 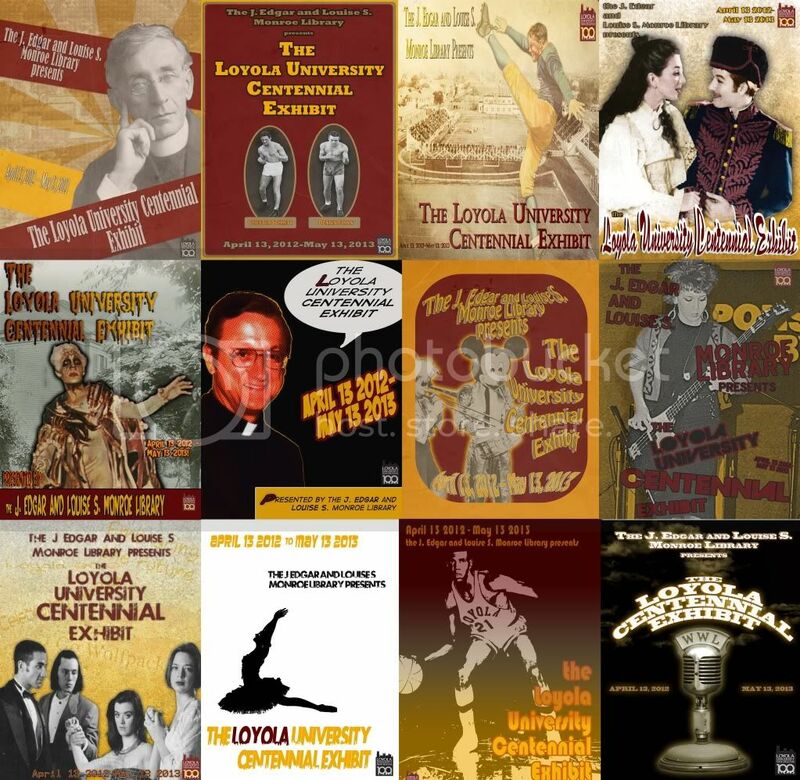 The Monroe Library proudly presents the Loyola University Centennial Exhibit, commemorating the university’s 100 years in existence. Come by and see photos, videos, costumes, artifacts, and original documents related to athletics, performing arts, buildings, history, photography, and more! There is also an exhibit in Thomas Hall celebrating the seventeen Jesuit presidents of Loyola. More information on the individual exhibits can be found here. Congratulations to our Kindle Touch winner, Ben Clement, who participated in a survey of faculty about their use of the library’s website. I attended Loyola as a student, but now I teach theater here, mostly continuing education students in the evening. I also direct and act in local theater. I just finished up a production of a play at the Shadowbox Theatre called Becky Shaw, which I directed. We got good reviews and it also starred Caitlin Clifford who is also Loyola alumni. Like my personal library. I use it to research plays and to find scripts. I also use the library website to access materials online very often, so thanks for being my cloud. How can the library help further faculty success? It would be nice if you could make a personal wishlist or basket of records in the catalog so I could find books at home and then be able to pull them up when I am in the Library. Thanks for using the Library, Ben! You are currently browsing the Library Lagniappe blog archives for April, 2012.